Back in August, the Satanists pushed for their statue of Baphomet if a monument related to the Ten Commandments in Arkansas was not removed (see also Satanists want Ten Commandments out or Baphomet in). 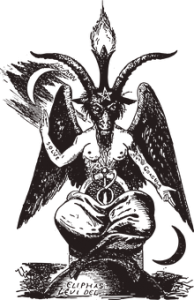 According to Wikipedia, Baphomet is a Sabbatic Goat, created by Eliphas Levi in the 19th century. Sabbatic is defined as of, relating to, or appropriate to the Sabbath as a day of rest and religious observance. The Satanists want a monument that mentions the biblical Sabbath removed if they cannot promote their religion (which does not advocate actually keeping of the seventh-day Sabbath). Three years ago, the Satanic Temple performed the ‘first state sanctioned satanic ceremony in history” according to news reports (see ‘Satanic Temple’s state-sanctioned capitol ceremony’). Of course by promoting blasphemy and abortion, The Satanic Temple is promoting evil. Promoting satanism and other forms of paganism is absurd, but sadly not unexpected. The Bible warns that God will send punishment “against an hypocritical nation” (Isaiah 10:6, KJV). The promotion of satanism is only one of MANY hypocritical practices in the USA. This entry was posted on Wednesday, December 5th, 2018 at 9:30 pm	and is filed under Religious News. Birthdays: A connection between Satanism and Astrology? What about Christianity?